Aerovista Innovations COO and founder of Women And Drones, Sharon Rossmark talks drones, Women to Watch and girls in STEM/STEAM. Meet Sharon Rossmark – one of the most notable women in the drone industry and passionate about supporting other women in UAS and rooting for their success. Sharon is the Chief Operating Officer at Aerovista Innovations (an unmanned aerial mapping, imagery solutions, and drone training company), and founder of Women And Drones – a premier global platform giving women in the UAS industry a prominent place for exposure. 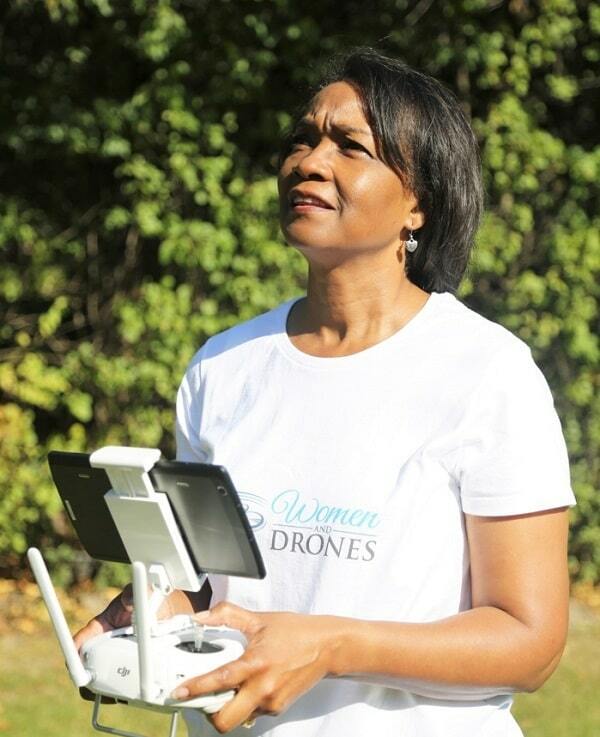 One of Sharon’s new projects is Women to Watch 2017, designed to acknowledge and motivate women who are impacting the drone industry through achievements in technology, business, education, research, journalism, advocacy, governmental relations, agriculture and more. We are looking forward to meeting the winners, and are definitely keeping fingers and toes crossed for Women To Watch to become an annual event! We are thrilled that Sharon found some time to chat with us about Women And Drones, the drone industry and STEAM (Science, Technology, Engineering, Aviation, Mathematics) for girls. When did you start Women And Drones and how has it grown in the past year? Do you see any patterns in women pilots (age, background, etc.)? The drone industry is very new and very exciting, yet when we look at data – only 4% of remote pilot license holders are women. What are your thoughts about it? Do you think we would have more girls in STEM if more classes were tailored specifically for women (addressing the fact that girls learn differently than boys) and taught by women lecturers? Women To Watch is one of the best initiatives I have heard of this year. Please tell us more about it! As of the time of this interview, it’s only been 8 months since the launch of Women And Drones, so we’ve yet to reach the one-year milestone. The idea for W&D came to me in July of 2016. I was completing forms for an upcoming industry panel and realized I did not know any of the other women who would be on the panel. As I searched online for information about the other panelists, little to no information was found about their experience in the UAS industry. I thought it would be great to have a community for women to connect, inspire and encourage one another. That’s when the idea came to me to launch Women And Drones. Since the initial launch, we have grown in several ways. In addition to capturing online stories about women in the industry, we now offer podcast audio interviews with plans to add video podcast interviews. We recently added a page to the website to focus on STEM/STEAM programs, in particular programs with an emphasis on engaging girls in learning about STEAM – drones/aviation. We have also grown in terms of audience reach. Our initial interviews were with women in the USA. Since those initial interviews, we have featured women from around the globe including Australia, Ireland, Italy, Spain, and Sweden. The patterns we’re seeing are not much different than you would see in any emerging industry. The majority of the women are coming into the industry after careers in other fields. Thus far, there’s not been one particular profile or career field facilitating the move of women into the industry. The two early patterns we’re seeing emerge include the women in drone racing tend to be younger. And, the women starting a drone business tend to have more experience in other fields of work. Actually, I find the statistic quite encouraging. While some may think of 4% as sobering we must remember, the FAA started offering the Remote Pilot Certificate in August 2016. The 4% representing women is as of year-end 2016, less than six months after the initial launch of the FAA certificate program for commercial drone operators. The other reason I find the number encouraging is because when I look at FAA-issued certificates in other sectors of aviation such as air transport (ATP) its only 4.2% female pilots. And, women comprise approximately 10.7 % of all commercial and ATP certificate holders. To have reached 4% after only a few months is very promising for the potential growth of women interested in the commercial UAS industry. Learning, sharing, and networking are keys to success. To help build confidence and to address the learning differences, creating a positive and supportive environment is critical to encouraging girls to develop an interest in STEM. Women inherently bring a different perspective and can help cultivate a balance in the development of girls. Hats off to the confident girls and women who have no problem speaking their mind in any setting. But, for those not as comfortable, we need more classrooms, social media sites and special events for females, where participants are not intimidated or afraid to ask questions. Shortly after launching Women And Drones we started receiving feedback from women about how thrilled they were to read the stories of the women featured on the site. We also heard from men saying they appreciated the positive role models of women in the industry and they were sharing the stories with their daughters. The more emails we received the more we knew the site was striking all the right chords with our audience. The “Women To Watch” global initiative came about as a way to further our mission of identifying women in the industry who are making an impact. Our award partner for the “Women To Watch” initiative is Drone 360 Magazine. The nominations have confirmed that the emerging UAS industry is full of inspiring women who are shaping its future and leading the industry closer to gender parity. The recognition is designed to acknowledge and motivate women who are driving change. Award recipients will be recognized in both the print and online edition of Drone 360 Magazine and featured on WomenAndDrones.com . We look forward to unveiling the finalists of the Women To Watch Award and share how they are contributing to the rapid evolution of the UAS industry. Thank you for the interview Sharon and we wish you the best of luck with everything you put your mind to! Are you a woman working in the drone industry or willing to work in it? Check our 6 empowering actions for women in drones, to learn, share your experience and get inspired by fellow women!